Researcher: Sanjay Kumar, Hong Kong Polytechnic University and Banaras Hindu University. Ground-based GPS measurements of the total electron content (TEC) in the ionosphere for the 2009 solar minimum and the 2012 solar maximum are different from the International Reference Ionosphere 2012 model (IRI-2012). The discrepancies suggest that there is a larger difference between the solar flux measured via radio emissions and the extreme ultraviolet flux coming from the Sun. Improving the model with multiple ground-based observations is important because the variability in electron content in the ionosphere caused by solar processes affects radio wave communications and navigation systems. The ionosphere is part of the Earth’s uppermost atmosphere where solar radiation ionizes particles creating a sparse sea of electrons. 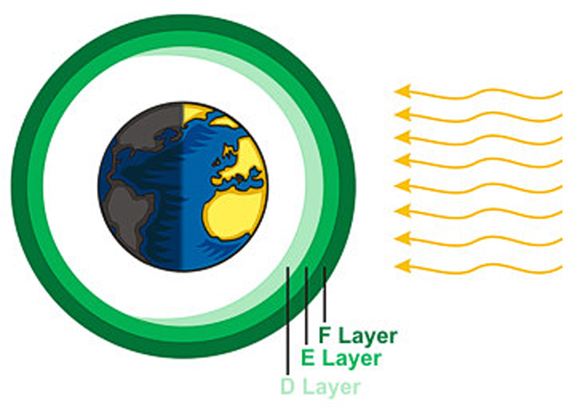 The ionosphere is important for reflecting and modifying long distance radio waves used for communications and navigation. It is essential to measure and understand changes in the ionosphere, especially the effects of solar storms, because these changes affect communications, navigation and potentially ground-based electrical systems. Ground-based GPS sites measure the TEC in the atmosphere by sensing the affect on the signal travel path from the 40-plus GNSS satellites orbiting the Earth to the thousands of ground-based receivers. Here the author uses seven equatorial International GNSS Service (IGS) sites to measure the TEC for the 2009 solar minimum and the 2012 solar maximum. These sites provide coverage of low latitude and well-spaced longitudinal coverage to compare with an established global model. The IRI-2012 model overestimates the TEC for monthly and seasonal mean values compared to the direct measurements by the equatorial GPS sites. The results suggest the solar radio flux measured daily by radio telescopes may not be providing an accurate enough proxy for the extreme ultraviolet solar radiation coming off of the Sun and interacting with the Earth’s ionosphere. More GPS measurements and further refinements to the model would be helpful to understand these solar processes and the amount of variability in the ionosphere. Kumar, S. (2016), Performance of IRI-2012 model during a deep solar minimum and a maximum year over global equatorial regions, J. Geophys. Res. Space Physics, 121, doi:10.1002/2015JA022269.